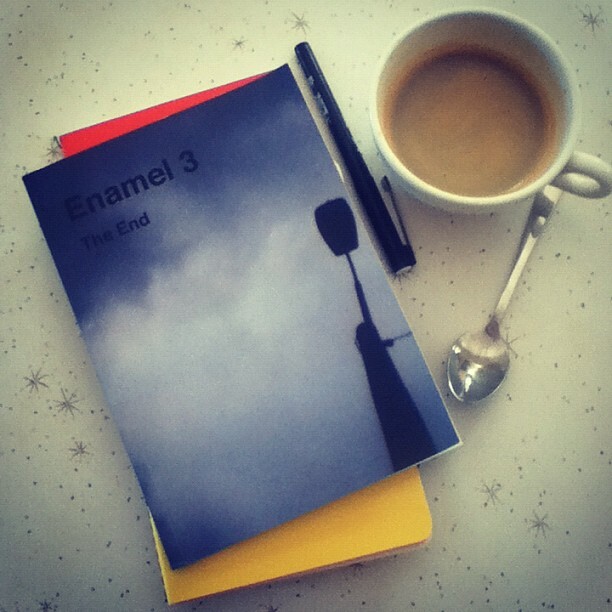 Enamel literary journal has come to an end, The End, which is a great shame as it is a well-edited and beautifully produced journal. It has, however, gone out on a high note, as the writing in this issue is stimulating, surprising and generally to be relished. Lots of my friends are in this journal, so I probably shouldn’t write about liking their writing, even though you don’t know who my friends are, but I do and I try to have a modicum of integrity, even though I can’t really because I am reviewing a journal edited and published by my close friend, Emma who chose three of my poems to go in the journal. Did she choose them because we are friends or because she liked the writing? No one will ever know except Emma, but I choose to believe the latter, because Emma is also a woman of great integrity and to believe the latter is better for my self-esteem. I loved the surprising and confounding images in Marisa Capetta’s two poems: ‘my husband has / the hands of an apple picker / too fragile for bread’ and ‘my wife’s taste and artistry are not easily / acquired by reading her shoulders back or thighs’. These are two beautiful, precise and unusual love poems. I don’t know how to describe Orchid Tierney’s poems, except to say they are form-pushing, delightful and literally need to be seen to be believed. Just click on the ‘free’ link above to go to Emma’s post where she announces she is giving away this issue, including postage! for free and how you can get one. All you have to do is send her an email. This is writing that has a lot to offer the reader and also writing which made me want to write. Thanks, Emma, for three great issues of Enamel, for your generosity in offering the final issue for FREE and for your canny editing eye. and nine of those people are my friends.